This year it’s all about what I like to call the “New Neutrals.” You know! Those blushing, rusted, coppery, and golden rose colors you keep seeing EVERYWHERE online and in the stores, where every blouse, sweater, dress, and accessory comes in it. Well, when you finally do get around to trying it on, let me tell you: you’re gonna be amazed at how those fading summer streaks suddenly pop and your skin gets it’s color back. For me this month is going to be all about blush rust or bust baby. So why do I love this new neutral trend so much? It’s really all about the luxurious effect layering these tones creates when paired correctly. If you see above the blush shirt dress I’m wearing is used as a base, grounding the multiple layers of the outfit. Before this season I might have thought this dress was clearly a statement piece, meant to be paired with quieter pieces, maybe just creams and ivories, and put away after spring and summer ends. Instead, I’m thinking THIS LBD is just as good as my old LBD, so why not dress it up like I always would a little black dress? Metallic details and accessories are extremely in this season, so I’ve take two thin metallic belts and created intrigue and light at the waistline (remember that metallics should always be highlighting a drawing attention to your best features, or the feature(s) you feel most confident about. 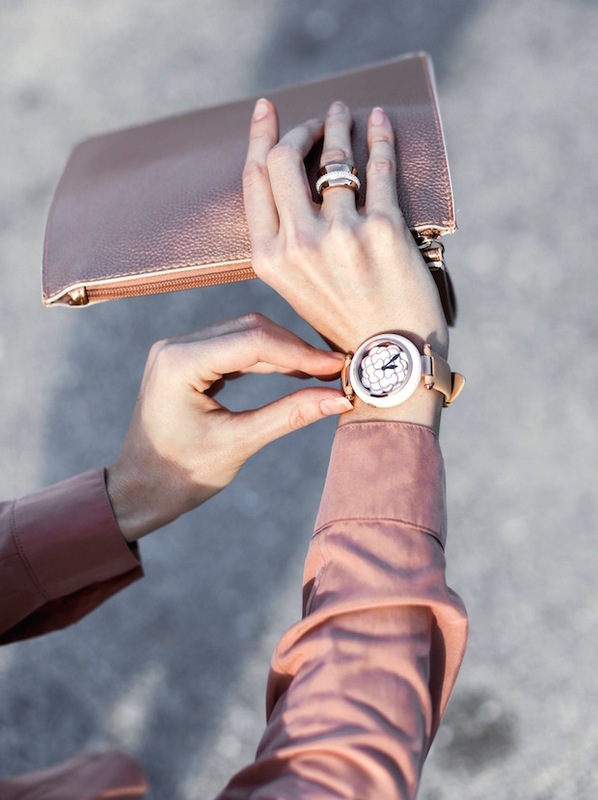 I’ve chosen all rose gold accessories (jewelry and clutch) to further enforce the sophisticated take on the pink palette. For the shoes and shades, I’ve gone for rust, choosing to anchor the look at the head and toe line with a deep tone, which works given my light summer sun kissed hair. This outfit stands alone nicely, but it really comes together when the camel robe style coat is added. 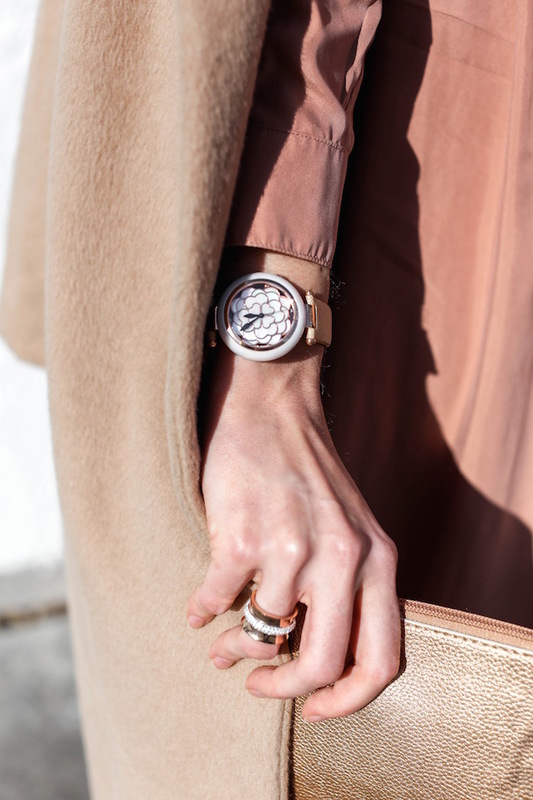 My camel coat happens to have a particular hint of metallic copper in the lining that when the fall breeze catches it, creates a moment worthy of any photog’s lens: it’s sheer street style magic and effortless elegance on point. I hope you all will experiment with these New Neutrals and find which tones work best for you. Shop some of my favorite blush, rust, and rose gold pieces bellow to get you started, and as always leave me a comment bellow and let me know if you’ plan to try out some of these new neutrals? Have you been experimenting already? What do you like? Dislike? I love hearing from you all, so thank you for all the emails, DM’s, and notes. I try to get to all of them as best I can!